Wineskin Supreme Las Tres ZZZ. Hand made of genuine first class goat skin, free of stains and cuts, vegetable tanned by traditional process and treated for impregnation of vegetal resine on the inside and outside of the wineskin. Triple stiched reinforced. The upper curbstone is made of bakelite, fully sealed. Straight and black color. Made ​​in Spain. Available capacities: 1 liter, 1.5 liter or 2 liters. It has been inside waterproofed by natural vegetable resins. 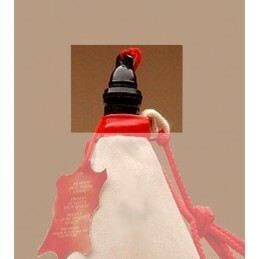 It has shoulder cord and is recommended for wine and liquors contain up to 30° alcohol. Not suitable for soft drinks, carbonated drinks or liquors of very high graduation.